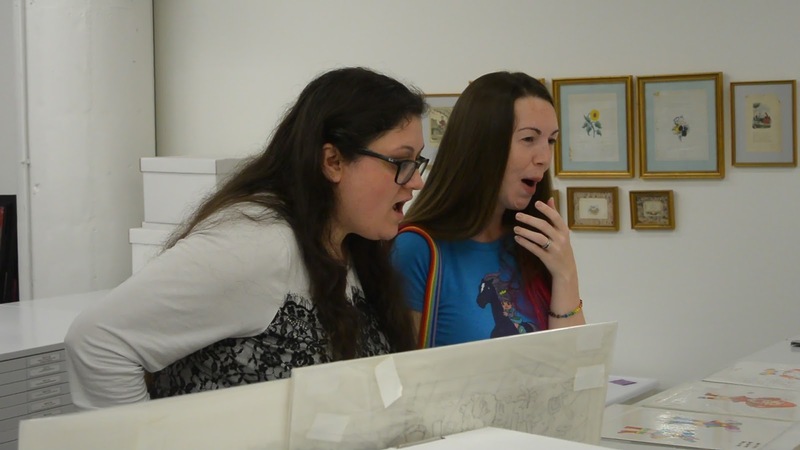 Let me preface this post by saying that giving tours is not something that Hallmark employees do often, and it is something that the Rainbow Brite team had never done before. 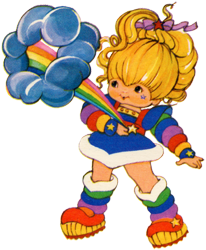 When I learned about Rainbow Brite Day and made plans to attend, I reached out to Headquarters to see if a tour could be arranged, but I had no expectations that they would be able to accommodate - especially with only a week's notice. To my delight, not only did they accommodate...they went above and beyond to make it a day that Renee, from RainbowBrite.co, and myself will never forget. 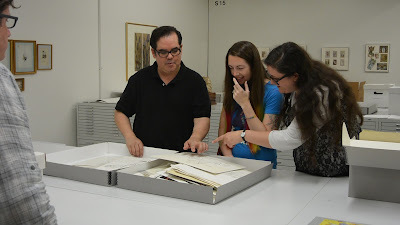 Our main tour guide ended up being Master Arist, Peter Martin, who had created new artwork for Rainbow Brite in recent years, and is still an active part of that team. When someone mentioned his last name, I had an "Oh THAT Peter!" moment, realizing who I was in the presence of. He was a wealth of information and so very kind to spend so much time with us that day. We first toured around different departments of the facility, each with its own theme and energy. It was overwhelming being surrounded by so much creative talent. I can only hope that a tiny bit of it rubbed off on me! 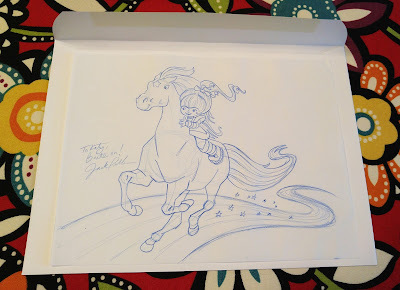 As we rounded a bend, we ran into Brian Pilachowski, who was the Pop-Up Artist on the new book, Rainbow Brite and the Stormy Race. We had a moment to let him know how much we adore his work and get a photo with him before continuing on. During our walk, I spotted something bright and colorful, and instantly knew what it was - the prototype Jumbo Rainbow Brite itty bitty! I had seen her in pictures, but never thought I would get a chance to see her up close. Not only that, we got to hold her and have our picture taken with her! Squee!! Next we were taken into the inner sanctuary - aka, the archives. Hallmark Archivist, Mark Spencer, met us there and took us in. I assumed we'd have to wear hazmat suits or something, but we did not ;) He had already laid out catalogs, original concept drawings wrapped in plastic, and boxes full of artwork for us to explore. We could take pictures of the catalogs, as all of those items were produced (and I did! ), but, as expected, we could not take photographs of the archive artwork. Some of it we had already seen on the official Rainbow Brite Facebook page, but many pieces were brand new to our eyes and gave us the squeals! A particular drawing of Baby Indigo still stands out in my mind as one of the most adorable. 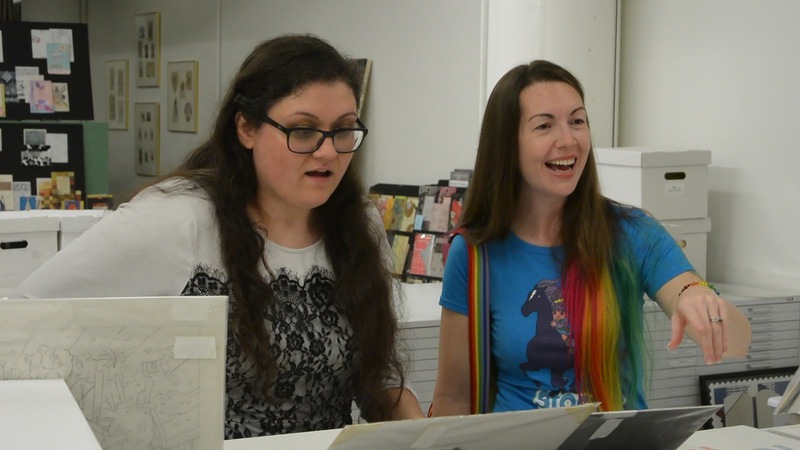 We took a break from the archives to meet the current team bringing Rainbow Brite back to life. They were all extremely kind and took some time to answer questions and show us some upcoming products. 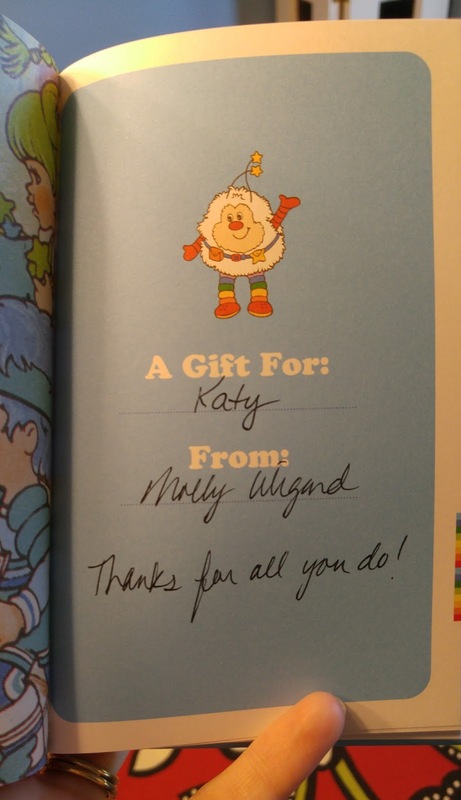 Kara explained why her voice sounded different between the two books (it has to do with the size of the speaker), Jack commiserated that when books come back from the printers, the illustrations are sometimes darker than expected, and Peter said they had intended to use the original head mold for the new Rainbow Brite doll. I still don't think he's sure why it was changed. 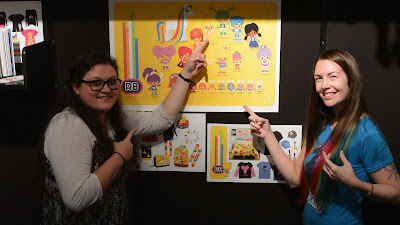 Jack also showed us an entirely new Rainbow Brite kids book that will be coming out soon. The colors on his computer screen were SUPER bright and saturated, so I think it's safe to say that many of my illustration complaints have not been his fault. He wanted to show us a second book as well, but we needed to move along in our tour. I'm looking forward to the release of them both. Then they gave us presents! We were not expecting that AT ALL. 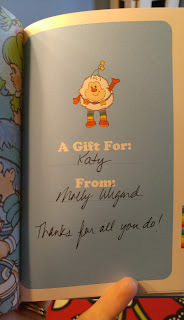 Molly Wigand was there, and gave us signed copies of her book, Wit and Wisdom of Rainbow Brite. We were given a Rainbow Brite itty bitty for everyone to sign, but ran out of time for them to do the signing (we were having too much fun!). They also gave us each one of the NYCC exclusive Rainbow Brite POP ornaments, of which they only made 100!! We were FREAKING OUT by that point, as we had been truly worried that we wouldn't be able to get our hands on one. 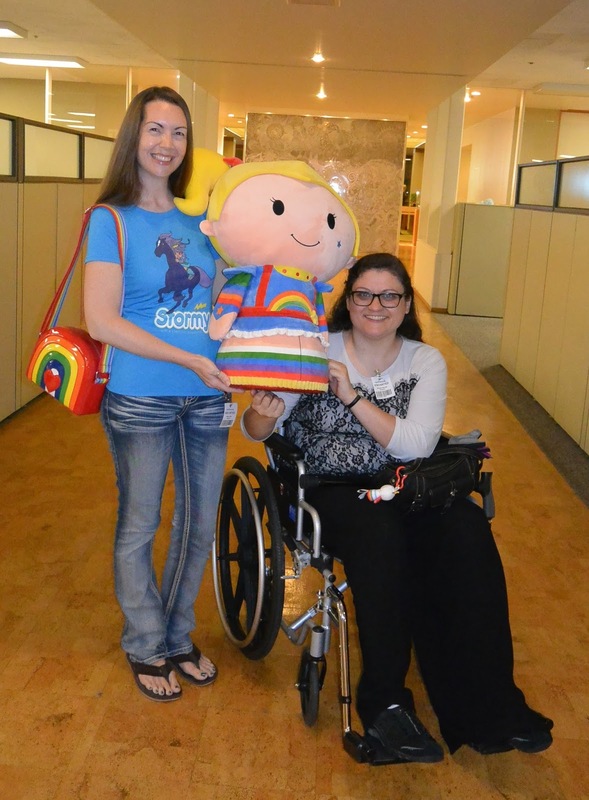 It's the most limited Rainbow Brite item ever produced, so to say we were thrilled is an understatement. 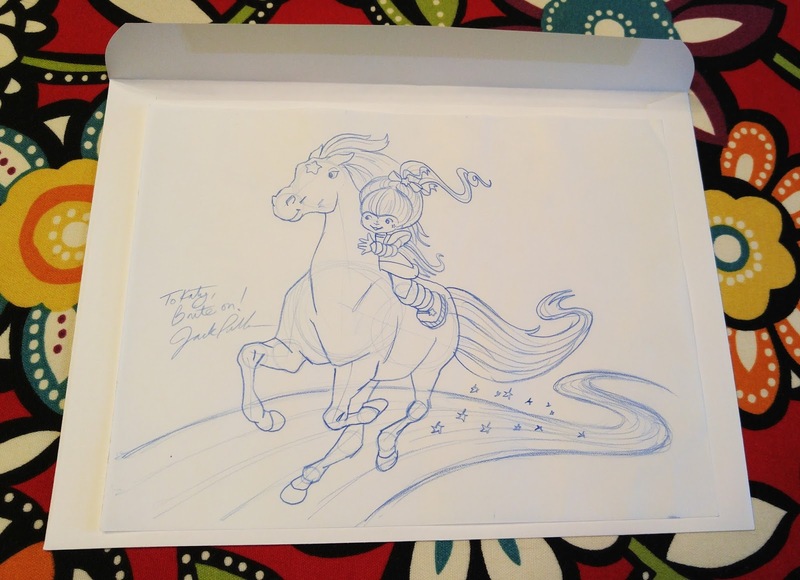 And to top it all off, Jack gave us original drawings of his artwork and signed them for us! It's a wonder we didn't faint right then and there. We also learned that some new products are more popular in other countries. For instance, Japan has licensed Rainbow Brite clothing, towels, etc that we don't have here, and some of the RB Pop items are already being sold in India! Jack Pullan has been designing the TeeSpring shirts that we've gotten over the past few months, so we have him to thank for that. 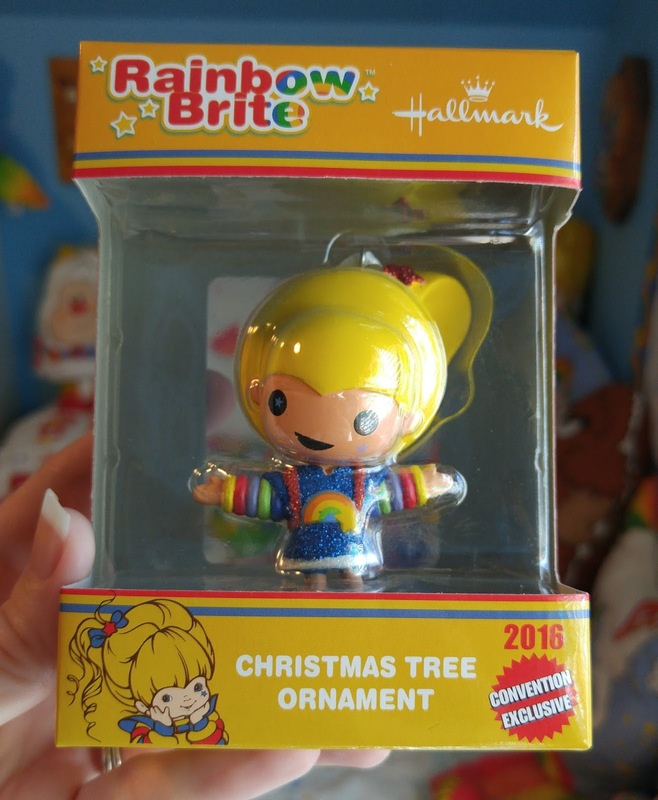 Also, Feeln has given Rainbow Brite back to Hallmark fully. They will no longer be continuing the mini-series they produced in 2014, and Hallmark will be taking over Rainbow Brite's website and social media accounts. I'm sure I've forgotten half the things I saw and heard. Most of the time, I thought I must be dreaming, and the rest of the time I was on rainbow overload. It was such a magnificent opportunity, it's definitely going down in my list of best days EVER! I want to thank everyone who pulled this together last minute and made it happen. All of those mentioned above, plus Erica and Sarah - you have my undying gratitude for making a life-long dream come true. You can also catch some behind-the-scenes shots of our tour in PopMinded's coverage of Rainbow Brite Day!